Binary options trading has experienced significant growth over the past few years, but its popularity does not mean that it is the right investment for everyone. While binary and Forex trading could offer noteworthy profit potential, they are quite different and may not serve the same needs. Find out which one is best suited to you. When trading binary options, you invest in whether an asset such as a commodity, a stock or a currency, will increase or decrease in value during a fixed time-period. The trader is shown the value of their earnings up front. In other words, you know exactly how much profit you will make on your investment should your prediction be correct, when making your trade. If your prediction is wrong however, you lose 100 percent of your initial investment. There is no variability in this form of trading since you can only decide whether an asset’s value will go up or down, but not by how much. Forex trading is the global platform where currency is exchanged. It is the world’s largest marketplace by far, with more than USD 5 trillion being traded daily. Trading takes place in pairs and a trader compares the value differentials between two currencies, such as the US Dollar and the Euro. Forex trading has high variability. On top of deciding in which the direction a currency will move, traders must also predict how high or low it will go. The Forex market is open 24 hours per day, 5 days per week. Contrary to other markets, the accessibility of Forex offers the clever trader an opportunity to react quickly to news and world events. Although weekend trading is not favoured by most traders, it remains open with limited functionality. Binary options are traded when the underlying asset’s marketplace is open. Generally, this means that it operates during standard trading hours. Trades can, however, be made on currency pairs. In that case, trades can be made 24/5. Both opportunities can be accessed on online trading platforms. Before entering a binary options trade, you will select its expiry time which can range from one minute to one hour. There are some brokers who allow traders to exit the trade earlier at a lower return than agreed. It is also possible to extend a binary option trade in order to achieve higher returns. It is important to note though, that these options are not offered by all brokers. In the Forex marketplace you are in control of your trade and can exit at any time you choose. With that said, open trades cannot be exited on weekends when the market is closed. 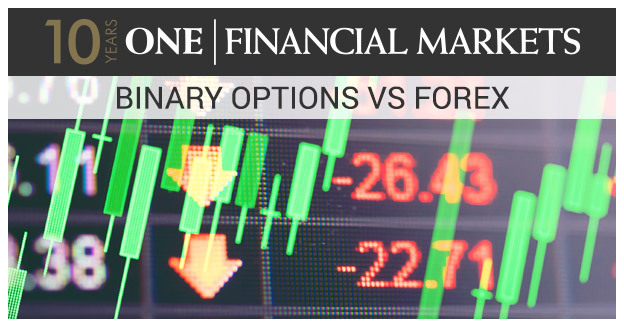 Binary options trading offers a wide range of markets, including stocks, commodities and currencies, whilst the Forex market offers a much smaller choice of trades. Although Forex trading mainly takes place in the four major currency pairs, there are many more pairs available. Trading in binary options is appealing because you already know the maximum profit or loss before entering any trade. Traders can simply enter the trade and wait for its expiry time, knowing that a loss is capped at their initial investment. The potential gains are usually lower than successful Forex trades, however. Profits from trading binary options range between 65 and 80 percent of the initial investment, whilst potential gains of 200 percent or higher are common amongst experienced Forex traders. The Forex market offers more variability and higher risk. Besides simply deciding in which direction a currency will move, traders must also predict how high or low it will go. The risk of a trade is therefore unknown. To manage their risk, traders enact a stop loss order, which prevents them from losing more than a certain amount or percentage of their initial investment. Volatility does not affect binary options. As long as your prediction when making the trade is correct when the option reaches its expiry time, your investment will not be hurt by surprise volatility. Forex is significantly affected by surprise volatility, often caused by news events. It is, therefore, crucial to set up proper risk management procedures when trading in Forex. Using leverage can significantly increase the profit potential of a trade, although it is important to approach leverage responsibly in order to minimise losses. Leverage ranges from 50 to 500 times the initial investment in Forex trading. This means that Forex investors have the ability to make significantly greater profits in a short amount of time with less upfront investment - although profits can never be guaranteed and remain affected by market movement and decisions of traders. In comparison, binary options trading offers no leverage whatsoever. The opportunity best suited to you is entirely dependent upon your investment goals and your appetite for risk. Because trading in binary options offers fixed risks and fixed rewards, it is well suited to the risk-averse trader. Forex may at times provide higher returns, but is more complex and is undertaken with more risk than binary options. With a lot of practice and a little luck, Forex trading can be lucrative and exciting. While countless investors have enjoyed great success, it is important to note that profits can never be guaranteed.